New and sustainable ways with horses: from the eco-farm with a single kids' pony to the full horse farm. Part I (Read part II here). I photographed this pretty horse farm in the eastern mountains of Washington State. The horse and human bond may go way back, but in modern times, horses seem much less like sustainable or even financial assets to diversified eco-farms except for the dedicated group that farms with draft or other work horses. Otherwise, many consider the pleasure horse a product of the elite, or a temporary high priced hobby for eight to 12-year-old daughters going through the ‘horse stage,’ or sons with rodeo fever. Extremely expensive to care for, heavy on land usage, and meant mainly for costly hobbies. But there are new, promising, and sustainable developments in the horse arena even for the diversified farm that just keeps a pony around for the kids. Those who already farm with multiple horses, or own horse ranches for breeding, training or other income, (or are thinking about it) may also find something new here. Within this two-part article, you may discover they can be integrated as an actual financial asset to the farm in a variety of other ways, and become part of a healthy farm fertility program. And, by using the systems of nature and perhaps incorporating a new natural boarding method called “Paddock Paradise,” you can eliminate a large portion of the expense and labor for horse health care, while maintaining healthier horses than ever before in the process. In a previous century of horse-drawn transportation, horse manure mixed with dry matter (spoiled hay, straw, chopped fall leaves, etc.) was a prized ingredient among the most successful market gardeners. City stables shared their excess with these surrounding family farms. The nitrogen and carbon combination of the two has the potential to decompose into calcium-rich dark compost. If you have this resource, it’s obvious that putting it to use on your own market garden, orchard, or even the garden that feeds the family will help balance out the horse’s expense by providing your own high quality compost. The first year we used compost from horse manure on our market pumpkin patch was the most prolific season we’d ever had. But once again in this century, horse manure compost is a product some would happily pay for. And they do. 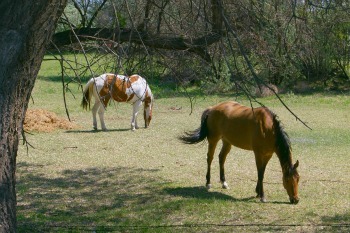 NOTE: The hay and other feed and straw used with horses must not contain products grown with herbicides. Loose hay and straw mixed with manure can still contain the herbicide, and though it may not obviously immediately harm the horses who consume it, it can pass through into the manure. Growers will end up with herbicide damage in their gardens. On 26-acre Whitewood Farm in Killingworth, Connecticut, owner Julie Shepard gives riding lessons, and trains and boards horses. She has operated the farm over the last 20 years, and eventually discovered a financially rewarding method of handling the mounds of horse manure and soiled bedding piling up on her horse farm. Looking for a way to diversify her income streams, she joined forces with her friend, Patty Pendergast, and they sell composted manure. The partners set up a composting system in the back of their farm where the manure and bedding are carefully turned, and sold three years later as rich, dark compost for about $20 a truckload. This solved the farm’s problems of excess manure, and brought in additional income. If you can produce sustainably created compost, especially that from horses fed the full spectrum of trace minerals (see Part II) you can develop a valuable product for sale via a sideline business that even your horse-loving daughter can at least partially operate. Rock dust or kelp can also be mixed with the horse manure during its composting to give it more value and help your product gain a reputation for supercharging garden and farm crops. Horses are intriguing to humans. They can play an important, yet casual role in attracting on-farm customers for producers that sell from their farm’s property. Even just seeing horses graze from a distance has proven a source of attraction and stress relief. Passersby will often slow down when seeing horses from the road. Chris Grant, owner of Indian Chimney Farm in Lansing, New York, raises alpacas and sells products from their wool direct from the farm. He also keeps a few other farm animals, including some riding horses for his own pleasure and the occasional sale. The farm is open for agritourism several times a year, and he states that the very youngest children seem to love the chickens the most. “For just about everyone else,” Chris said, “except those who want to start an alpaca business someday, it’s the horses. Physiologically they have a huge heart. Somehow it seems as though they show it. They are willing to make a heart-to-heart connection with anyone who is open to this.” The Grants’ pleasure horses have become a draw for on-farm visitors whom then often purchase other on-farm products. 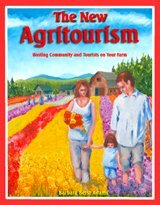 In the book, Micro Eco-Farming: Prospering from Backyard to Small Acreage in Partnership with the Earth by this author, a story is told of “Dusty,” a family’s pet horse who adds immeasurable value to customers of his owners’ u-pick blueberry patch. Dusty mows the parameter around the patch, keeping weeds and wildlife from encroaching into the blueberry patch. The parameter isn’t suited for other crops, and his presence creates a built-in petting zoo, where visitors can get close to a live horse in addition to picking their own berries. People who purchase farm-direct not only want a superior heirloom or fresh-picked product, but they want atmosphere, experiences and memories as well that connect them on a deeper level to the farm. Stan Urmann, owner with his family of Riley Creek Blueberry Farm in northern Idaho, also uses a horse, or in his case, a pony, to attract customers to come directly to his blueberry farm. He states in a research report conducted by Rural Roots, Inc. and the University of Idaho that he actually uses off-farm farmers’ markets more as an advertising outlet to get customers to come directly to the farm, than to actually sell blueberries there. At the market, he does sell berries, but feels handing out brochures is the main advantage, and when he does, he entices entire families to come to the farm with the promise of a pony their kids can pet or ride. Stan prefers to sell most of his berries via u-pick, which he states cuts out many of his harvest expenses. So enticing customers to drive to his farm is important. Using a single pony to attract customers has worked well for a winter u-pick farm in Washington State as well. Families return season after season to hunt and cut their own Christmas trees at Woodbee Christmas Tree Farm. One of the main attractions started out as “Randolph, the Phony Baloney Pony Who Thinks He’s a Reindeer.” Randolph is a furry little Shetland adorned with reindeer antlers and hand held by “Santa” or the farm owner for children to come near. As one of their customers myself, I know people came from miles away, year after year, to see how Randolph was doing. Big business has often used the idea of a memorable fictitious character as a sort of promotion (Ronald McDonald, Tony the Tiger). It can work just as well, if not better, to create a real life local or regional character legend. Teddie Grace described the history of Randolph, which goes way back. “Dave (Grace) and I are the new owners. This will be our third season. "Randolph and all the traditions of the farm were the ideas of the former owners. We tried to keep everything the same for people like yourself who have special memories. The former owners are Chuck and Gail Jaeger.” Teddie continued by saying that Chuck started it from a memory of raising his own kids. “When his children were small, his Uncle Bill dressed up as Santa and put deer horns on a pony and came around the corner of the house and the kids were in awe of what they saw. Years later when they started the tree farm they remembered this time and thought that would be a fun thing to have at the farm. Chuck found a guy in Seattle (about two hours from their farm) who made props for movies and theatre productions and asked him to make antlers that were lightweight. Low and behold Randolph was born. Randolph is loaned/rented to us by the Morris family in Oak Harbor. He is only here during the Christmas season. Last year, we got a new Randolph because the former Randolph was getting older and the Morris' thought he was not as patient as he once was. The new Randolph is a girl, much younger and a bit more spirited. The account below further explains why horses can be such a customer draw. We’ve long known that ponies will attract children (who will then talk their parents into coming to the farm to visit), but the draw might have more depth and cross into adulthood more than we once realized. Most are familiar with the businesses of traditional horse boarding, breeding and selling, plus training horses and humans for riding, including the new natural methods. Many have also come across the often non-profit enterprises that allow the disabled to ride horses as a form of therapy. But there’s another market – the everyday non-riding citizen -- to tap into. Otherwise “normal” citizens with no plans to become riders or horse owners, and who are free of commonly understood disabilities, have daily stresses that mount up to unhealthy lives, and many today have serious nature deprivation. There’s something about horses and their ability to bond with humans, whether they are riders or not, that is almost as attractive as dolphins for helping humans heal. Leigh Shambo who started out in Washington State and now operates out of California, also has had much positive experience connecting ordinary humans, including non-riders, with horses. The photo above is of one of her students as she works with her. She founded Human-Equine Alliances for Learning (HEAL), which offers services and programs that promote human healing and evolution through the creative and non-violent experience of the horse-human bond. “Our therapy programs, personal growth workshops and facilitator training programs are open to people with any level of horse experience, and no riding is involved,” she says. While experienced riders have also found her programs to work wonders for their riding hobby or profession, she has seen great things with non-riders as well. It was her own healing with horses that made her aware of the potential of horses as healers. “As a young adult,” Leigh said, “I earned a degree in Animal Science from Southern Illinois University, and began a career teaching riding and training horses. Then, in 1988 when I was 31 years old, two things happened that set me on a new course. A serious riding accident resulted in a broken pelvis, leaving me with a long period of rehabilitation and significant fear once I did start riding again. And later that year, my mother ended her life by suicide, a shock that prompted me to seek therapy. As I got back to working with and training horses, I found myself undergoing a process of emotional healing that was truly life-changing and profound. 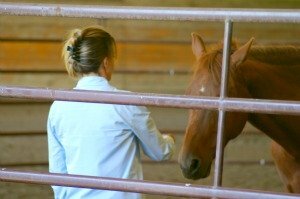 “Soon after, I started learning new horse training techniques: what is now referred to as ‘natural training’ or ‘horse-whispering.’ These techniques rely on an emotional bond with the horse, a trusting partnership instead of forceful techniques applied to unwilling horses. Most of this work is done on the ground, without even a halter or rope on the horse. I could not help but notice that the horses were highly attuned to my process of psychological healing and growth. This author observed Leigh teaching her students on a horse farm where she put on a fee-based workshop. She allowed each student to choose a particular horse to work with, and then to enter a ring with the horse who was free within the ring. The student then became quiet, and began to “tune in” with her equine companion. “Even ‘non-horse’ people quickly build strong bonds and positive relationships with horses when they are able to practice emotional self-awareness, clarity without judgment, and assertiveness coupled with gentleness and respect. Of course, these very same qualities enhance all human relationships as well! The horses’ responses provide immediate guidance to people for accessing these qualities within themselves. There is an old saying, ‘The horse doesn’t care how much you know, until he knows how much you care.’ But, how do we put our caring (for ourselves and others) into practice? In very precise ways, the horses seem to show us the way to translate caring into appropriate action. “To give a concrete example,” Leigh said about a situation where her workshop became quite valuable to a human participant, ‘Sally’ (not her real name) was plagued with feelings of regret over her divorce and its effects on her teenage child and her personal dreams. Before entering the pen with a horse named Frieda, she expressed the desire to have Frieda give her a sign of forgiveness, an affirmation of her innate worth in spite of her recent experiences. For several minutes, Frieda ignored Sally, and moved away whenever Sally made attempts to approach her. What was Frieda trying to say? This is an example of a situation calling for expertise in both horse psychology and human psychology! Not all farmers who offer casual interaction with horses will choose to also offer workshops with the depth that Leigh’s workshops provide, but her knowledge and experience can help explain why a human may have an otherwise unexplainable healing, simply by the approach of a horse. For those with horses on their property who would like to attract customers with more serious workshops, and don’t have the training to do it themselves, people like Leigh or those she's trained can travel to your farm. When speaking with a different woman who managed a horse ranch for troubled teens, she said the parents gladly pay for the expense of such programs. “One mother told me this type of program was less expensive than drug rehabilitation.” To help out with teens whose parents can’t afford such a program, some farms and ranches have had luck with something similar to the 10% tithing idea. For every ten full paying customers, a full or partial scholarship is offered. Liability costs can be too high, unfortunately, for some farmers to add horses as an attraction for on-farm customers. If your horses or ponies don’t include riding for the customers or actually being in the same pasture or paddock with them, check to see if they can be covered at less cost as distant viewing, or if a well-fenced or non-riding, supervised petting zoo type of arrangement is in place. Also, check to see if your state has any new revisions on liability involving people who provide horse interaction for the public. In some cases, the revisions may be in the horse owners’ favor. On Indian Chimney Farm, farm visitors are not allowed to feed the horses, which cuts out the opportunity for accidental bites. And the horses are always separate from visitors behind a strong fence, which eliminates the hazard of kicking. Visitors can approach the edge of the fence and pet a horse if the horse chooses to come near. This way, if horses aren’t up for human contact, they’re not forced into the situation, adding to the chance of any contact between human and horse being especially friendly. Whether your farm customers will interact with your horses, or they are kept only for personal use, natural horse care is helping a growing number of horse owners eliminate costs while producing far healthier horses at the same time. In Part II of this article, we’ll explore how “Paddock Paradise” and other innovations in natural horse care can eliminate many traditional costs, worry and labor, give horses even on small acreage more exercise while taking up less room, provide better health, superior hoof strength; eliminate founder and parasites and the cost and time of preventing or curing them, and more. Horse gifts! 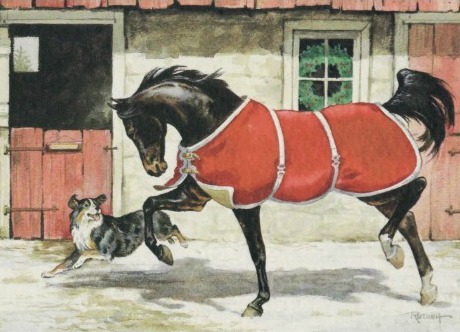 T-shirts, vintage horse print cards, horse wrapping paper, posters, calendars, more!